Ok so I am failing a bit on regular blog posting, facebook (business and personal), the website and numerous other online sites for holiday rental I am on have sapped the joy I had for blogging. However the little break has helped and I did so delight in the blog before, it is a bit of a diary for me and acts as a great recorder of info, which comes in very handy when my memory fails. So I intend to try and revitalise the relationship once more, perhaps I just need to seriously allocate a day and time each week month to posting...maybe! This post will be a general catch up on what has been going on the past few weeks months...there could be a fair bit so we might have part 1 and part 2. The days are certainly getting shorter, summer this year was pretty pathetic with most days overcast and wet. However September and October have definitely tried to make amends with sunny blue skies. Even though there is now snow in the mountains, we have not had snow in town as yet but plenty of other places in the north have...I don't think it is too far away. These are the kind of days I love! Ok where to start, I do seem to be busy, the days always whizz past way too fast but I think my time is taken up with a whole lot of procrastination which is so frustrating and sometimes just stops me from moving forward, certainly something that I need to address....but nonetheless I am never bored. The main thing I procrastinate from is my BAO project which is floating in limbo land at the moment, it is so close to being resolved but not quite there. I am so struggling with the concept of editioning as it so goes against the way I work as an artist. Printmaking is primarily about the multiples...I obviously failed that class and my book will definitely be a varied edition. I have spent a lot of time on this project (not all well directed) and am close to finishing the first book...once this is done I feel I will be able to move on more quickly doing certain sections for the edition all at one time speeding up the process (in my head that is how the scenario plays out). The plan is to have them all complete by the end of the year. Of course what has happened is I did not plan well at the beginning, had an idea, then went full steam ahead, straight into a few brick walls. I did not consider what is feasible given time constraints or ease of access to resources (which is quite limited here). Instead of trying to keep it simple (I chose to ignore that little alarm bell going off in my head), I have ended up with a book that has four, one metre long surfaces to print on....each stage taking several layers to get the desired effect that I am happy with. The main problem to resolve at the moment is adding the text which has caused a few issues. I experimented with the digital printer but just was not happy with the results. However I have been playing with drypoint and that maybe the way I go. Here are a couple of glimpses so members of my #5 group in BAO will know I am making headway albeit slowly. I follow quite a few blogs and often read stories of bloggers of like, meeting up...never happened to me until recently back in May. I had a phone call from my son who had, had a phone call from a local restaurant saying that there was an American couple who follow my blog wishing to meet up with me. The restaurant is literally only 100 metres away so off I went and what an enjoyable encounter it was to meet up with Terry and Georg. Terry has been a follower of my blog since the early days when I first set out on this journey and we had exchanged a couple of emails during that time. Georg was born in Iceland and his family emigrated to America when he was young. It has been a dream of theirs to move to Iceland at some stage, the dream I think is a little closer to realisation as they scout the country for the right home and venture. 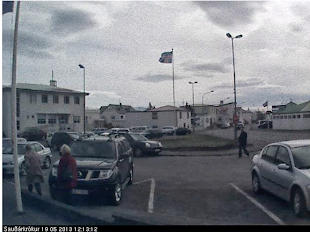 We chatted away so easily, time flew by and they both ended up staying a night at Gamla Pósthúsið. They are truly a lovely couple, I am so pleased to have met them and look forward to catching up with them again, especially once they are here for good! 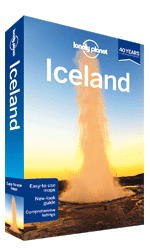 Last year you might remember that Lonely Planet payed us a visit as they were touring the country for material for their 2013 Iceland guide book. Well the new guide is out and I am very happy to say that Gamla Posthusid is included and was selected as their top choice for accommodation in Saudarkrokur and one of 5 top choices for North Iceland. It has been just the best source of free advertising with many visitors making a booking on just the say so of Lonely Planet. Most travelers however do tend to book via the Booking.com route, I decided not to go down this path as they take 20% of every booking made, which seems a ludicrously large amount to me. There is a stubborn part of me that is very anti huge conglomerates that take over an industry leaving nothing for the little guy, so it may take a bit longer to get known but I am willing to wait. I would rather put the extra money I would be paying them into what I provide for each guest to make their stay a little more special. So whilst I have not been totally booked out this past summer, I have been happy with the response and bookings to date...and believe that good service will pay off in the end. It is looking very promising and I am already getting enquiries for next summer, so the word is slowly getting out there. When I entered into this adventure and never having worked in the hospitality industry I did not know whether the role of host would be to my liking. I am a bit of an introvert and one who loves my own space. However I must say that I am pleasantly surprised at just how much I have thoroughly enjoyed meeting so many wonderful and interesting people from around the globe. I have had some very favourable reviews posted on TripAdvisor plus many leave wonderful handwritten messages in the guestbook for me to read after they have left. I will leave you with an amusing little tale of one group of guests. You can imagine my surprise when I woke one morning, looked out the window and saw the Australian flag flying on the flag pole in front of the building. This photo taken in July, pretty much depicts what the weather was like all summer long. The person responsible was one, in a group of 3 guys who stayed overnight during their ring road tour. Two were Australian and one Canadian, one of the Aussie guys happened to be the nephew of a very dear friend of mine in WA, so we chatted for a bit and took photos so we could share with her. The culprit taking the flag down before setting off on the next leg of their journey. Apologies for such a long post, I will try to make them shorter and more frequent in the future. Monday Ice will be back this coming week. P.S. Just when I say we've not had snow in town, tonight it snows...a light dusting...probably gone by morning. Thanks Kerry, I had a lovely day. Lovely to see you back Vicki - and a great catch-up! Thanks Fiona, you amaze me with your very regular posting. I'm so glad you're back! All the Saudarkrokians have been a bit light on the blogging front (of course so have I) this european summer. I was thinking about writing a post today, too, while shuffle some electronic papers around. which might make you feel better about procrastinating (or worse!). Sorry about the big links, I don't have time to find the code to make it look nice. I can't believe booking.com takes 20%!! That is crazy. I will definitely try to contact the vendors directly in future. Thanks Maja, I will have a read of those articles...just procrastinate a little more with them. Yes I was pretty shocked with the fee from booking.com plus the contract you had to sign also felt as if you were signing your life away. I prefer to have control myself over the bookings. Welcome back Vicki. It's great to hear the accommodation business has been successful and I also enjoyed the piece about your BAO book. Hope it all comes together for you. Thanks Helen, I promise I will get the book finished sooon! Good news! Thanks for posting and best wishes! Well, that was a catch-up! When you said you were taking a blogging break I think I must have removed you from my reader (I have been travelling a lot this year!) and only noticed, by sheer chance, on Robyn's (Personal Histories) that you're back. And I've reinstated you in the reader.